Resistance Heaters are essential in U-bolt units for pollution free workshop. 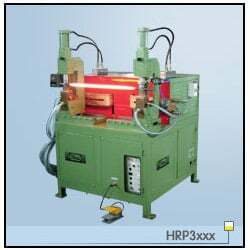 We have both electronic and electrical machines, This one is Pneumatic operated electronic machine for higher production. It's inside control panel placement makes it highly durable because of no external control wiring. It has 0.02 to 280 second digital heating time setting with heat of function. Transformer secondary have hollow construction for maximum cooling and electrodes have designed to flow extra coolant this enhance electrode and transformer life.